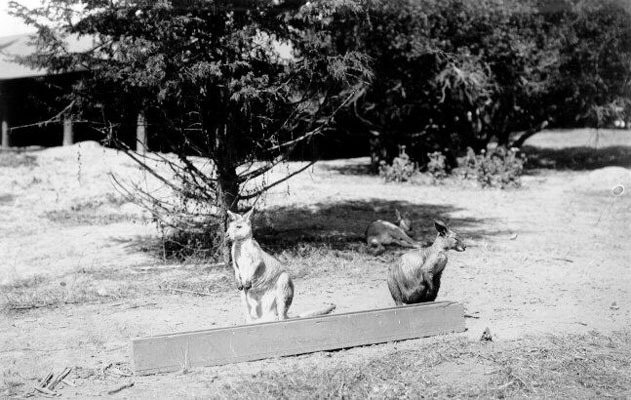 kangaroos in golden gate park, from the SFPL Historical Photographs Collection, n.d.
A full page, illustrated article in the Sunday, August 27, 1905 edition of the San Francisco Call celebrated the many animals housed in the park at that time. The “head keeper,” William Leland was in charge, and his duties including birthing and bottle-feeding many of them. 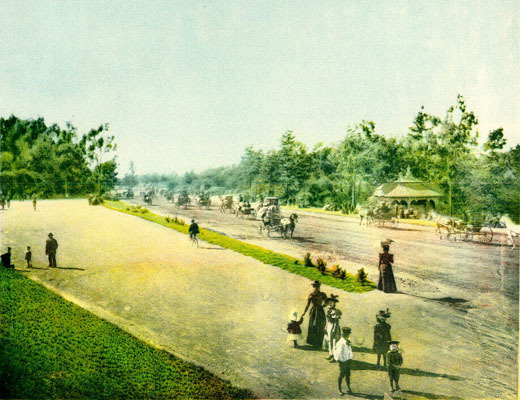 The author, Florence Thrale, described large herds of deer, elk and buffalo, a pair of antelope, seven kangaroos, sixty peacocks, ducks on Stow Lake, two grizzly bear cubs, a sable and a pair of porcupines. Most of the animals had been born and raised in the park. This motley menagerie delighted park visitors and was the predecessor to the San Francisco Zoo. But the real surprise in this story is the description of Leland’s colleague, Officer George William Clark. Readers were advised: “If you take your morning constitutional any time between 4 and 9 in the morning or your evening amble between 4 and 7 in the evening and see a sharp-eyed, white-mustached man, lean, wily and active, with a gun in his hand and a checked cap on his head lurking in the park woods, don’t suspect him of poaching. ” His job was to shoot “four-footed trespassers.” His take included six coyotes that year, as well as six gray foxes and thirty-seven weasels just that summer. Also hawks and king-fishers (the nature of this threat is unclear) and numerous stray dogs and cats. Another reminder of how times have changed! This entry was posted in "lost" golden gate park, history, people, wildlife and tagged golden gate park, urban wildlife. Bookmark the permalink. It was a different world indeed. The blog Death of a Million Trees had a post mentioning Fish and Game killing all kinds of animals as late as 1931 — including a lot of hawks and housecats.